Adult Swim viewers who are still awake at 4 a.m. may have recently happened upon Too Many Cooks, a 12-minute video, airing in an “Infomercials” slot, that is a clever sitcom spoof that slowly metastasizes into a full blown case of deconstructive insanity. 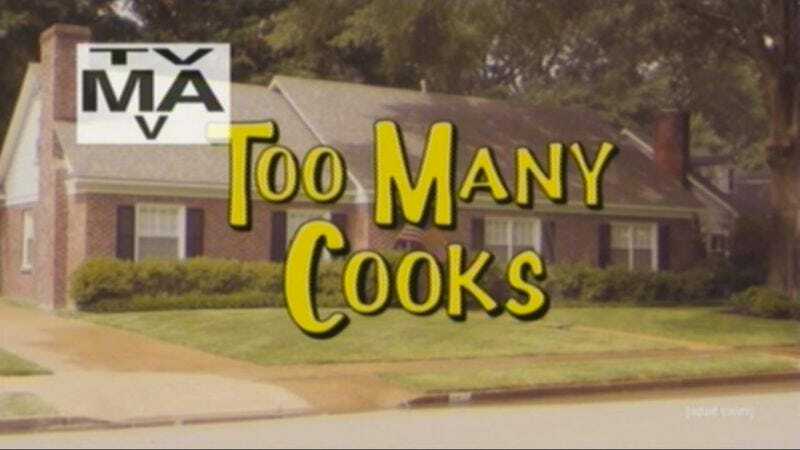 The brainchild of Casper Kelly, Too Many Cooks begins as an exaggerated parody of ’70s and ’80s sitcom intros like Eight Is Enough, Just The Ten Of Us, and Too Close For Comfort. But just as one gets tired of the joke of the ridiculously long list of cast members, Kelly’s short expands beyond its roots into other genres, including detective shows, primetime melodramas, cartoons, and space opera fare—all while leaving a growing pile of dead bodies in its wake. Amidst all of this is the slow breakdown of whatever reality exists within these opening credits, playing like Astron-6 and Vernon Chatman remade Don Hertzfeldt’s Rejected for the Nick At Nite set. It’s surreal, gruesome, and utterly hypnotic.